Do you have that aching feeling that it may be time to replace the windows on your home in Escanaba, Michigan, or a surrounding area? If so, there are some important things to look for to determine if it’s time for replacement windows. First of all, if your energy bill has grown out of control it is likely that you are wasting energy through drafty or old windows. With new windows in place, your home will be better insulated and heat transfer will be reduced significantly. Secondly, if it’s become increasingly harder to open or close your windows, that is a sign that they have become swollen due to old age or moisture damage. Don’t force yourself to deal with windows that aren’t working properly and just have them replaced with a more functional solution. And, if you notice any decay or leaking windows this is a sure sign that it is time for a replacement. Moisture entering your home can cause costly damage and can be prevented by simply replacing the windows on your home. If you’ve come to the realization that it is time to replace the windows on your home in Escanaba, MI, or a surrounding area, look no further than the experts at The Window Store Home Improvement Center. 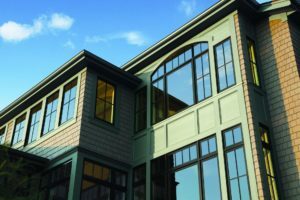 We proudly offer windows in a wide variety of colors, styles, and functions so you can feel confident knowing you’re receiving a product that complements your home. And, our installers are all factory-trained and -certified so you can rest assured your windows will be installed correctly the first time. In fact, we stand by their work so much that we offer an impressive two-year labor warranty in addition to any manufacturer’s warranties you may receive. For more information about the replacement windows we offer to homeowners in Escanaba, MI, and the surrounding communities, contact The Window Store Home Improvement Center today. When you do, a knowledgeable member of our team will happily answer any questions you may have. We are very pleased with the product and service!